A full mouth rejuvenation or full mouth reconstruction is a smile makeover plus more. It is more than cosmetic work, although it can include any amount of cosmetic work. It also addresses your bite, also known as your occlusion. This is the way the upper and lower teeth come together, and is a function of how well your jaw joint works and how well your teeth are placed. A misaligned bite is uncomfortable and is closely inter-related with a misaligned jaw joint. The jaw joint is small and delicate and very flexible. You can feel it by opening your mouth with a finger placed in front of one ear. This is where the lower jaw (mandible) meets the skull, and it’s a little ball-and-socket joint. Most dentists don’t address any jaw joint issues. If you have a misaligned bite, you need to see a dentist who provides neuromuscular dentistry. We offer neuromuscular dentisty at our Oakton, VA, office and serve patients in Reston, Vienna, McLean, Great Falls and the greater Northern Virginia area. Why Pick Softouch Dental Care? Dr. Michael Chung is a graduate of LVI, the Las Vegas Institute for Advanced Dental Studies. It attracts dentists from all over the world and teaches advanced techniques and theory of both cosmetic dentistry and neuromuscular dentistry. Dr. Chung is well-trained to provide whole-mouth dental care with full mouth rejuvenations, treating not just your teeth but your gums, jaw, and muscles as well to provide a result that is cosmetic and functional. The effects of a healthy smile go far beyond your mouth. Not only will you feel a tremendous boost in confidence, but you may see far-reaching health effects, including the improvement of conditions you would never have imagined were related to your dental problems. TMD symptoms are many, varied, and painful or at least uncomfortable. They can appear in any combination. The most common and painful symptom is chronic severe headaches, but you might also have anything from earaches to worn teeth to tingling fingers. Dr. Chung can diagnose and provide TMD treatments for these symptoms. We are proud to utilize the 3D Cone Beam Dental Scanner to assist us in our neuromuscular dentistry treatment. A full mouth rejuvenation will address all issues related to your smile, and will enhance the beauty of your smile as it addresses the health and structure of your bite. Each rejuvenation plan is different. To discuss and learn more about yours, please call us at 703-319-6990 to set up a free initial consultation. From there, you and Dr. Chung can look further at what needs to be done, in what order, and to what effect. 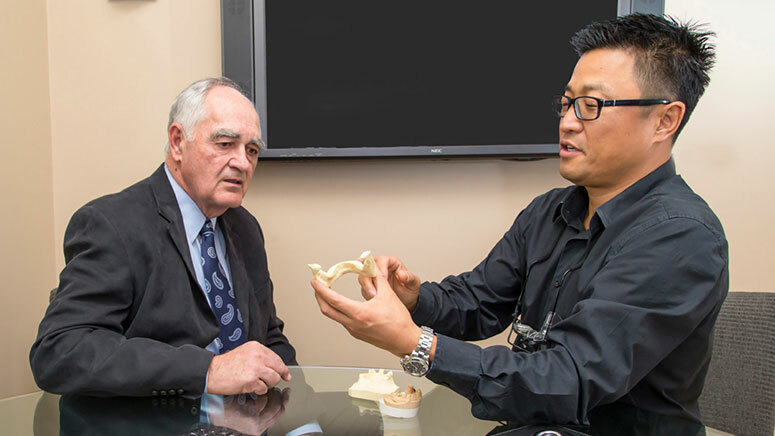 At your consultation, you can meet with Dr. Chung and his talented cosmetic dentistry team and have all of your questions answered. We will also discuss the financing options we offer to help you budget your smile rejuvenation. The first step in your full mouth reconstruction would be your initial cosmetic dentistry consultation at our Oakton area office. We are confident that when you contact Softouch Dental Care, you’ll be pleased with the high level of service we offer. We see only two or three patients per day so that we can give you the detailed attention and care that you deserve. “Thanks for all of your help with giving me the PERFECT SMILE! You guys are great!" Northern Virginia Cosmetic Dentist, Dr. Michael Chung provides information about cosmetic dentistry to patients in Northern Virginia, Washington DC, Oakton, Reston, McLean, Great Falls, and Fairfax, Virginia. The information provided on this dentistry website is not intended to be medical or dental advice. Please contact our Northern Virginia cosmetic dentistry office for more information about the dentistry services we offer. This website is not intended for viewing or usage by European Union citizens. View our accessibility and nondiscrimination statement.